Until recently, I still believed that if I put a Fresnel between the lens and the ground glass the focusing plane is not the same as that in the film holder. When I bought my Pacemaker Speed Graphic (Optar 135/4.5 lens) it had no Fresnel lens. However, before taking the first photograph I measured the groundglass depth with a micrometer and compared the value with the film depth in my holders: there was a 1 mm difference (approximately). After shimming the groundglass and later calibrating the rangefinder, I took some photographs and the results were perfectly sharp. I recently confirmed that the groundglass placement was correct by taking the photograph shown here using a tripod and focusing on the grounglass with a 10x lupe. The test I ran is similar to one published in a recent issue of View Camera magazine: set an array of flat things with enough detail (dollar bills were used in the article) at increasing depth at close range, focus on one of them, and see if you get it in focus when you process the film. I focused on the center card to get (more or less) a 1:2 reproduction on film, using a Graflex 135/4.7 Optar lens, wide open. Processing the film revealed that the center card was perfectly in focus. My Pacemaker Speed Graphic seems to be designed to have a Fresnel between the groundglass and the lens. If no Fresnel is used, the groundglass must be shimmed back by about 1mm. I hope this will help clarify the situation to others who may have doubts about the right placement of the groundglass/Fresnel in these cameras. At any rate, the test that I used is simple, fast, and accurate enough for its purpose, and can be used with any view camera. I have scanned the negatives in my flatbed scanner, even though I have no transparency adapter. I used my Beseler 4x5 condenser head as a light source. 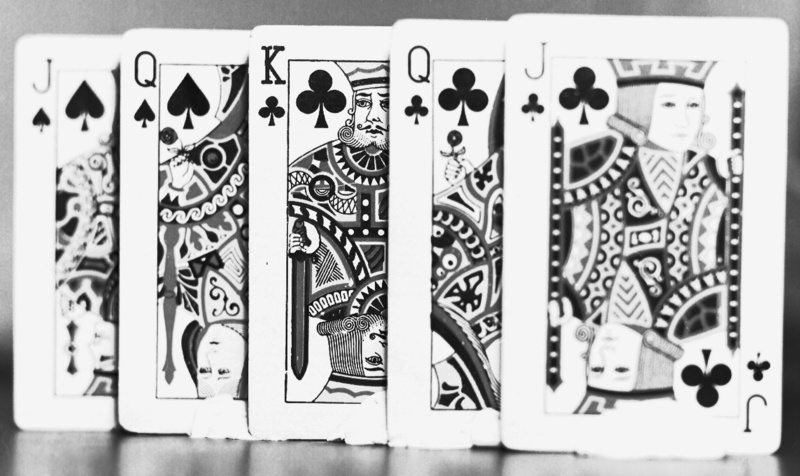 The results are decent, and show my point: the accurate focus in the center card (the King) is easy to notice. Both Queens (in front and behind the King) are clearly less sharp than the latter.